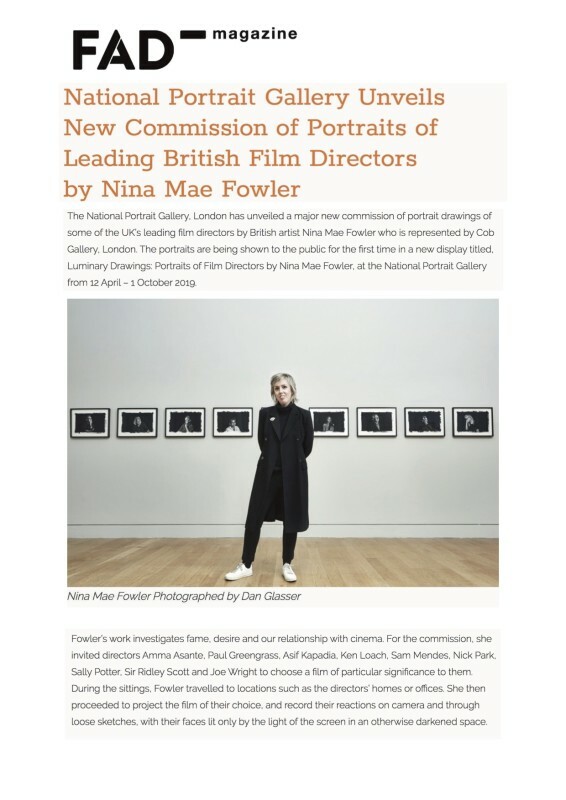 The National Portrait Gallery, London has unveiled a major new commission of portrait drawings of some of the UK’s leading film directors by British artist Nina Mae Fowler who is represented by Cob Gallery, London. The portraits are being shown to the public for the first time in a new display titled, Luminary Drawings: Portraits of Film Directors by Nina Mae Fowler, at the National Portrait Gallery from 12 April – 1 October 2019. Fowler’s work investigates fame, desire and our relationship with cinema. For the commission, she invited directors Amma Asante, Paul Greengrass, Asif Kapadia, Ken Loach, Sam Mendes, Nick Park, Sally Potter, Sir Ridley Scott and Joe Wright to choose a film of particular significance to them. During the sittings, Fowler travelled to locations such as the directors’ homes or offices. She then proceeded to project the film of their choice, and record their reactions on camera and through loose sketches, with their faces lit only by the light of the screen in an otherwise darkened space. Fowler watched the films of the sittings frame by frame to extract stills that would form the basis of the final charcoal drawings. Intriguingly the artist has chosen not to reveal the directors’ film choices. The only clues the viewer has are their reactions and the exact frame they were watching at the time of the portrait which is documented in the titles of the drawings. The intimate scale of the works draws the viewer into the minds of the people behind the lens, conveying the inspiration felt by the directors when watching great cinema. Nina Mae Fowler (b.1981) is best known for her sumptuously detailed large-scale drawings and installations. Her work interrogates themes of celebrity, beauty, power and sexuality and is preoccupied with Hollywood’s ‘Golden Age’. Fowler has been shortlisted for numerous prestigious prizes and awards, including the Jerwood Drawing Prize (2015 & 2010), Aesthetica Art Prize (2014), Drawing Now Award (2014), Young Masters Prize (2012) and the BP Portrait Award (2008). Past commissions have included portraits of evolutionary biologist Professor Richard Dawkins and biographer Dame Hermione Lee. Her works have been exhibited internationally, including frequent solo exhibitions in London, Paris and Leipzig, and are held in private and public collections including New College, Oxford, UK and the ‘Try-me’ collection, a public foundation in Richmond, Virginia. In 2018 David Lynch’s establishment Silencio in Paris held a retrospective of Fowler’s work.